The origin of the library can be traced back to January 1921, when the University College was established opened at College House in Colombo. The nucleus of the library was a collection of 2,500 valuable books on history, literature and oriental studies donated by Sir Ponnambalam Arunachalam in memory of his late son A. Padmanabha. By 1939 the book stock had reached 27,000 volumes when the library was shifted to a more spacious building named “Villa Venetia”. 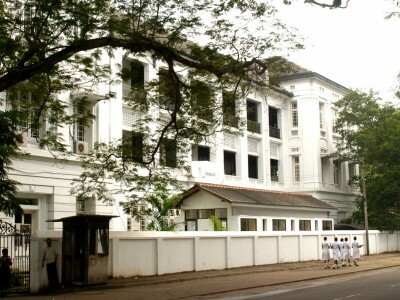 Sir Ivor Jennings, the first Vice-chancellor of the University of Ceylon, had recommended the construction of a new building in Colombo for its library in spite of the decision to shift the entire University to Peradeniya as he felt the new library “would serve a future University there”. However, this did not materialize and the collection was shifted back to College House when a decision was taken to demolish Villa Venetia to pave way for new constructions. 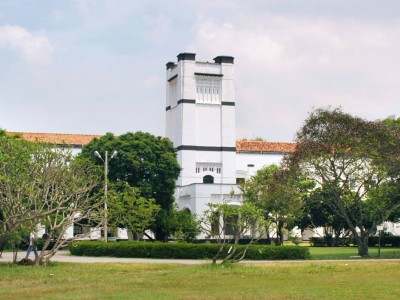 When the University of Colombo was established in 1967, the library ceased to be governed by the University of Peradeniya and became a separate library. The library was shifted to the National Pavillion now known as the ‘Old Library Building’ where it remained until the collection was shifted to the ground floor of the Law faculty building in 1986 and to the new building in 1999. 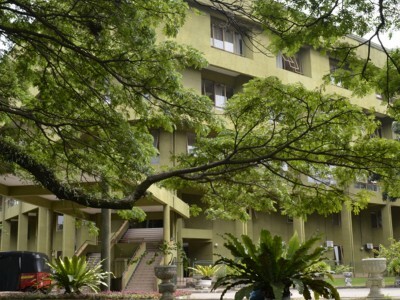 The Library system currently consists of the Main Library located at Philip Gunawardena Mawatha (Reid Avenue) and the libraries of the Faculties of Medicine (located at Kynsey Road), Science and Graduate Studies located respectively at the Medical Faculty and Science Faculty, and the FGS premises. The University of Colombo library system consists of the Central Library and faculty libraries. The Library, Faculty of Medicine is at Kynsey Road and the Library, Faculty of Science is at Thurstan Road. The Central Library is situated in a five storied building between the Law Faculty Building Complex and the Arts Faculty Building Complex. The library contains books and periodicals in Humanities, Education, Law, Management, and Social Sciences. The main entrance to the library is facing the Reid Avenue. The Library of the Medical Faculty, University of Colombo was founded in 1870 the same year the Medical Faculty was inaugurated. It was set up in the present building in 1955. The library is the second oldest medical library in the whole of Asia. It is located on the first floor (adjoining Dean’s office) in the Administration building facing Kynsey Road. The library consists of the Main Reading Room, the Librarian’s Room and Stack Room (ground floor). The seating capacity is 148. The medical library offer services especially to health professionals and the para-professionals in the island as well as in the South East Asian Region. The origin of the library can be traced back to January, 1921, when the University College was formally opened at College House in Colombo. The nucleus of the library, housed in one of the rooms, was a collection of 2,500 valuable books on history, literature and oriental studies donated by Sir Ponnambalam Arunachalam in memory of his late son A. Padmanabha.